NEW CASTLE, PA, U.S.A., April 6, 2015: A combination of abrasion-resistant screw and barrel materials based on Nordson’s metallurgical expertise extends the working life of plasticizing units for injection molding and extrusion by substantially reducing wear from filled compounds in an era when loadings of 50% or more are not unheard of, it was announced today by Nordson Corporation. ● X8000™ Screw Encapsulation. 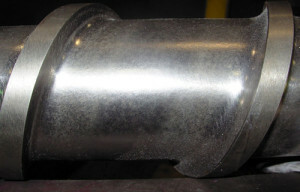 Nordson applies this nickel-based alloy with high tungsten carbide content to the entire screw geometry in a high-velocity oxy-fuel (HVOF) coating process; it then fuses the alloy to the parent metal of the screw in a two-step method that forms a metallurgical bond, rather than the purely mechanical bond formed by standard HVOF coatings. In addition, X8000 coating is double the thickness of other HVOF-applied coatings—0.50 mm versus 0.25 mm. The high nickel content provides enhanced corrosion resistance. ● X800® Barrel Inlay. Also a nickel-based alloy with tungsten carbide, the X800 inlay is more wear-resistant than iron-based, iron-chromium, and nickel-cobalt alloys, providing exceptional abrasion and corrosion resistance with highly filled materials and high-temperature engineering polymers. Nordson offers the abrasion-resistant package as a way for processors to meet the challenge posed by growing demand for highly filled compounds. In automotive manufacturing, for example, carbon fiber-reinforced composites are in growing demand as light-weighting alternatives to metals. In under-hood auto applications, compounds heavily filled with glass and minerals are now widely used. A similar challenge is posed by the growing demand for highly filled halogen-free flame retardant (HFFR) compounds for wire and cable. Processors are commonly using calcium carbonate filler at 50% loadings. And the growth of metal injection molding poses yet another abrasion challenge. Photo Caption: Screw with competitive carbide coating (top) shows poor adhesion and chipping, while screw with metallurgically bonded Nordson Xaloy X8000™ coating (bottom) exhibits no chipping.